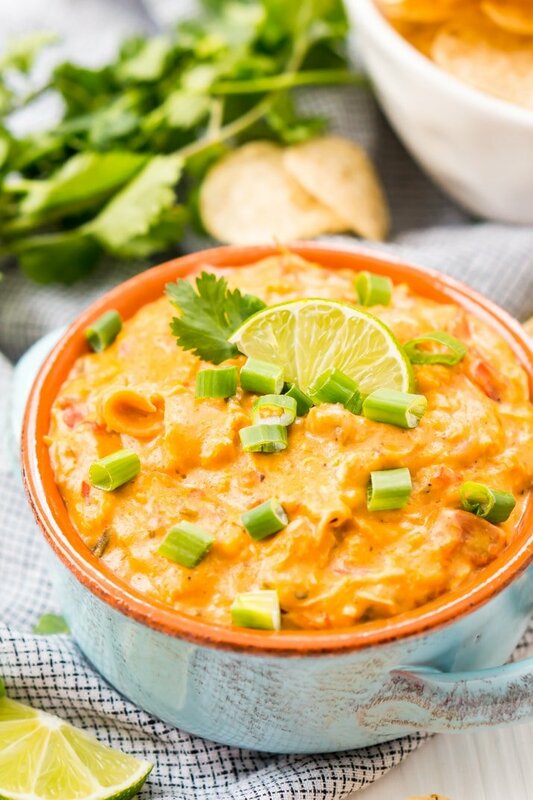 This Slow Cooker Chicken Queso Dip is an easy and addicting party dip made with shredded chicken, cheese, green chiles, tomatoes, green onions, and lots of spice! I’ve always been the girl at the party standing around the slow cooker or bowl full of dip, I can’t help it, they’re all just so addicting. 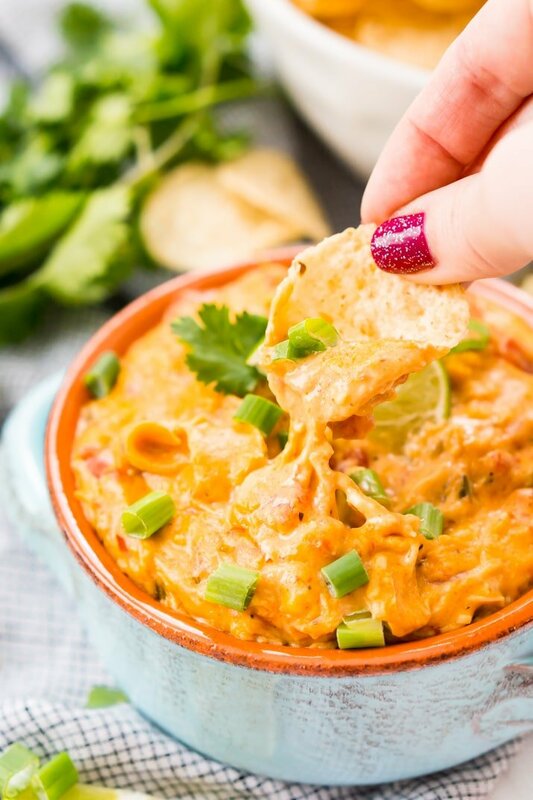 Especially when it’s a dip that’s as creamy and cheesy and delicious as this Chicken Queso Dip! Queso has always been a serious weakness of mine, I can’t resist ordering it every time we go out for Mexican food and I try to make it at least a couple times a year at home. It’s super easy to whip up with a batch of margaritas to serve on game days! JUST TAKE ME TO THE CHICKEN QUESO RECIPE ALREADY! 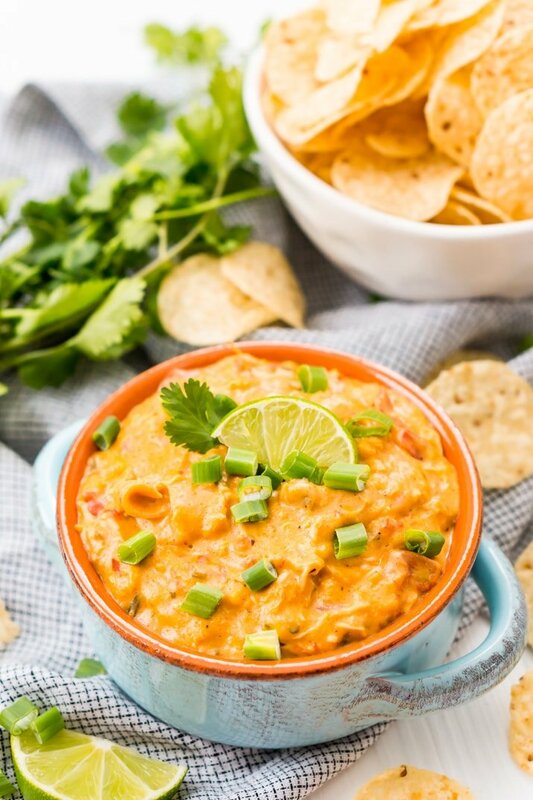 Queso is short for Chile con queso, which is a thick sauce of melted cheese seasoned with chili peppers, typically served warm as a dip for tortilla chips. What Kind of Cheese Do You Use In Queso Dip? That’s the beauty of queso, it’s just thick melted cheese and you can choose whatever cheese you’d like! Most recipes include more than one kind of cheese, cheddar cheese being the most popular option. This recipe is made with Velveeta (which technically isn’t a cheese) and 4 Cheese Mexican cheese which is a quick-melting blend of Monterey Jack, Mild Cheddar, Queso Quesadilla and Asadero cheeses. 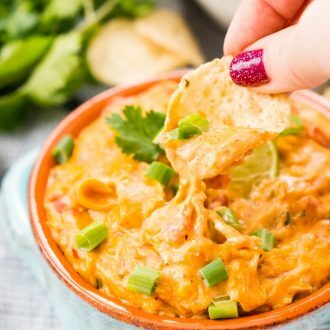 Want to make this queso recipe without Velveeta? Swap it out for an additional cup of Mexican cheese and an 8-ounce block of cream cheese. Now, I am not a fan of canned chicken, which seems to be a common ingredient in hot dips, I prefer to either take the extra time (about 30 minutes) to bake and shred my own chicken or to purchase a rotisserie chicken and shred that. This recipe requires about 2 cups of shredded chicken, 1 large breast or two smaller ones should cover it. Plus, it doesn’t need to be exact since the only thing it will really impact is the thickness and texture of the dip, not the flavors. Once you have your chicken ready, all you really have to do is throw everything into a slow cooker and let it cook on low for about 3 hours or until the cheese has fully melted, then you just have to stir it up and you’re ready for a party! 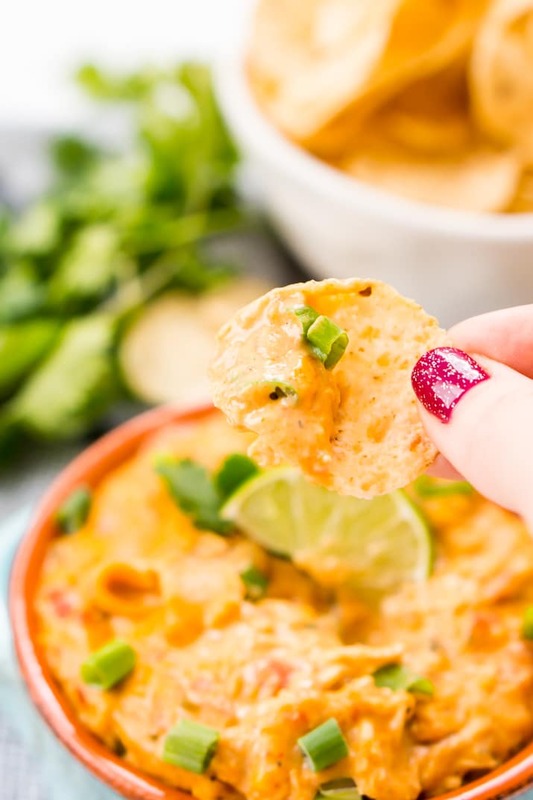 Serve this queso dip straight out of the crockpot with tortilla chips! I promise you everyone will love this dip, they might even love it more than the one their favorite Mexican restaurant serves! 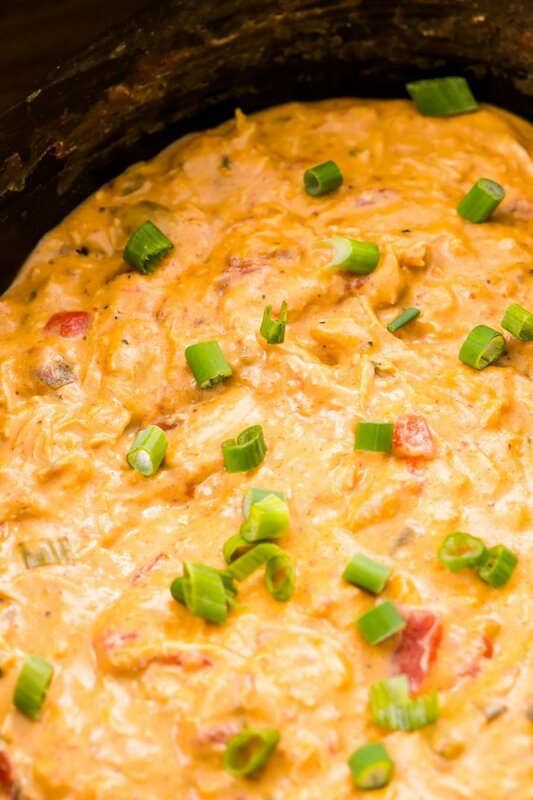 Pin this Chicken Queso Dip Recipe for Later! Spray the slow cooker with cooking spray and set to low heat. Add the shredded chicken, diced tomatoes (do not drain), green chiles, green onion, seasoning, and spices in the slow cooker and stir together. Add the cheeses to the top, do not stir them in, and cook on low for 3 hours. Once the time is up, stir to combine all of the ingredients, turn slow cooker to "warm" and serve out of the slow cooker with tortilla chips. Cayenne pepper can be omitted if you don't want a super spicy queso dip. If you'd prefer to make this without Velveeta, replace it with an additional cup of the Mexican cheese and an 8-ounce block of cream cheese, cubed. Haha – my mind is busy trying to work out what canned chicken might taste and look like – it’s not something that is available in the UK. But we do have some tinned meats, all of which I’ve avoided since forever, so I’m thinking you decision to include freshly cooked shredded chicken is definitely a wise choice. Your dip sounds very tempting with all those flavours in there.